Where is the subaru Legacy 1991 diagnostic plug? It will depend on whether yours is an OBD system or not. OBD (On Board Diagnostics), didn't start to become a legal requirement until 1996 but some companies were fitting them earlier than that. First check your steering column for the green style connector on the attached image. If there is none like that, use a torch and get your head into the Driver's side footwell. Your looking for the black style connector, (red circle), on the attached image. It will be at about the height of the driver's knees at the door side. They are sometimes tucked up under the dashboard, out of sight, possibly behind a small flap or cover. Try removing the shifter cable from the shifter arm on the transmission . Remove the arm from the shaft on the transmission and position the arm 180 degrees and install it back on the shaft. reconnect the shifter cable to the arm and see what is does then. Outside of that I don't know. How many miles do you have on the car? Are there any leaks? Are there any funny sounds when you try to start the engine? Any knocking sounds? If this is a manual transmission you may have worn shifter parts. If it is an automatic you most likely will need an overhaul, most transmission repair shops give free inspections in hope they get the work of repairing what is wrong. Coil or ignition module may have failed. On a 1991 Subaru Legacy fwd 2.2L, which pins do I ground to retrieve A/T codes?? And where can I find a list of the codes?? its behind the dash and its circular in shape. its hard to reach even with the lower panel removed but with a long flat screwdriver the bracket that mounts it can be popped open to gain access. Check backing brake plate , sometimes it's bended and touching brake rotor. If wheel bearing is bad , you may have same effect with backing plate , brake rotor touch backing plate. The speed sensor is located on the transmission output . I don't think the problem is in the dash. Go to YouTube and type in where is the speed sensor on a 1991 subaru legacy and it will bring up all related videos. Hope you find this useful. How do you replace front the wheel bearing? Remove the caliper and rotor, undo the axle, ball joint and the two strut bolts, and take the entire knuckle off. The hub is pressed off, then a circlip removed to press the bearing out. You need a hydraulic press to do this job. How do I change the heater resistor? Remove the glove box, you will see two connectors held in with screws with wires going to them. The lower connector is the resistor pack. Disconnect the connector, remove the screws and the resistor pack will slide out when pulled on. Then put the new resistor pack in making sure the orientation is correct, install the screws, reconnect the connector and install the glove box. Then you should be all set to go. I hope this info helps! 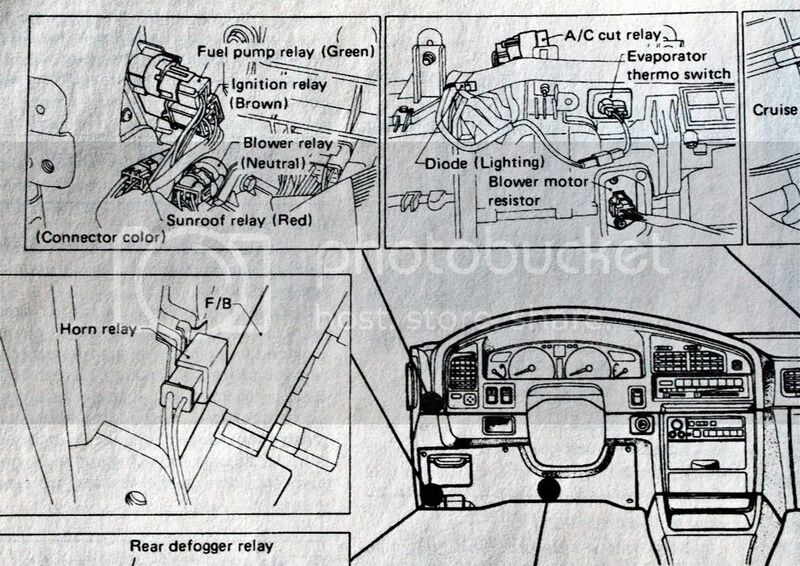 Where is the heaterswitch resistor located on a 1991 subaru legacy? It is located behind the glove box, once you have gained access to the space behind the glove box you will see wires going to two separate connectors that are being held in with screws. The resistor pack is the lower connector. I hope this info helps! 1991 Subaru Legacy power ligh blinks 14 times on startup. Can you tell me what this code is? If it is engine related, the code is for the #1 fuel injector. If it is transmission related, It means that the output signal circuit of shift solenoid 2 is open or shorted causing a no shift concern. I hope this info helps! Where is the heater resistor located on a 1991 subaru legacy? Its in the under dash (right side) evaporator housing for the A/C system. It mounted on the outside case so access is fairly simple. Removal of two screws and an electrical connector is all it takes. You may have to remove glove box to see it for the first time. Air movement in that housing helps keep that resistor pack cooled down...They can get fairly hot so be careful.